Sri U. Ve. Velukkudi Krishnan Swami had conversation with Sriman Gopalaswamy (Retired Election officer) on various aspects of Democracy and Monarchy relating them with the great epic Ramayana. As family servant of Kaikeyi, Manthara lived with her from the time of her birth. Kaikeyi was raised by her wet nurse, Manthara, who accompanied Kaikeyi to Ayodhya as a trusted maid upon her marriage to Dasaratha. Manthara is said to be hunch-backed and ugly in appearance. Meaning: Manthara, a housemaid who was residing with Kaikeyi since her birth, accidentally ascended the balcony of Kaikeyi's white palace, which resembled the full moon. Manthara, a housemaid who was residing with Kaikeyi since her birth, accidentally ascended the balcony of Kaikeyi's white palace, which resembled the full moon. From that balcony, she saw the entire city of Ayodhya, with all its principal roads being sprinkled with water and strewn with heaps of flowers. Manthara further saw from that balcony the city decorated with the best of flags and banners. The roads were cleared for uninterrupted traffic. All the people took head-bath. Brahmans with flowers and sweets in their hands were chanting Mantras. The gateways of temples were white washed. There were sounds of all musical instruments. The city was filled with rejoicing people and resounding chant of Vedas. The elephants and horses were also merry. The bulls were making roaring noise. The highly delighted citizens hoisted rows of flags on their housetops. Manthara asked a house maid with bright pleasing eyes and wearing white silk clothes standing nearby, as follows: - "Why is Kausalya giving away money to people so delightfully today in charity, even though she is badly lured of money?" "Why are people so happy today? Is the king duly pleased with something, doing any great act? Tell me." That housemaid, bursting with joy, told Manthara in a great gladdening tone about the great honor to be conferred upon Rama. "Tomorrow on the day of Pushyami star, king Dasaratha is going to anoint the fault-less Rama for the princely kingdom." After hearing the words of that maid, Manthara quickly with wrath walked down from the roof of the palace, which was in the shape of mount Kailasa. Manthara of sinful thought; burning with anger, approached Kaikeyi who was lying on a bed and spoke these words: "O, fool! Get up. Why are you sleeping? A dreadful situation is befalling you. A flood of troubles submerges you. Why are you not knowing this yourself? Oh, Kaikeyi ! You appear to be a beloved wife for your husband, but in reality he does not like you. You boast of your fortune. Like the flow of a stream in summer; your fortune is unsteady". Meaning: Kaikeyi’s mind was polluted by Mantara. She asked for the two boons promised long ago by Dasarata when kaikeyi helped him in a war. These boons were made use now, and by one she asked for the exile of Sree Rama and by the other she asked for the coronation of Barata. Dasarata bound by his promise could not go back on his words. He kept quiet. In spite of all his pleadings Kaikeyi insisted on the execution of the two boons and sent Rama to forest. Lakshmana who is the right hand of Rama also went with Him. Meaning: A good cause always attract hurdles. The greater the task, the mightier the obstacles. That is why the person who wants to perform noble deeds must be ready to face opposition from the very outset. Those who are not prepared for obstacles begin to falter and ultimately surrender in the face of opposition. The path of spiritual excellence is beset with numerous obstacles. When one sets out on a great task, innumerable difficulties must be confronted. Once there was a fierce battle between the gods and the demons in the forest of Dandaka. King Dasaratha went to help Indra and was accompanied by Queen Kaikeyi. In the fierce battle with the great demon Shambara, Dasaratha fell to the ground and lost consciousness. 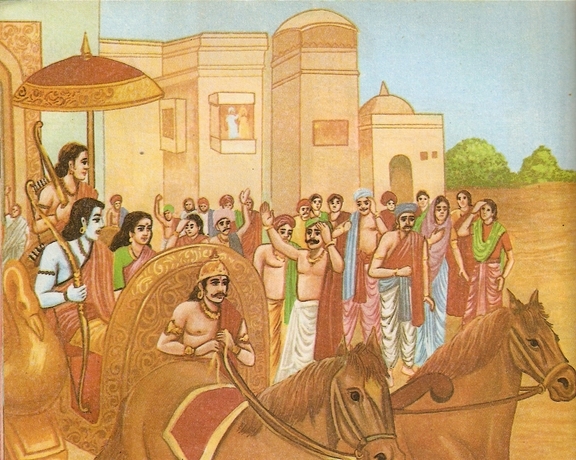 Kaikeyi quickly drove the chariot away from the battlefield and thus saved his life. The king was very pleased and grateful and granted her two boons. Years later, King Dasaratha decided to let his sons take over the reigns of Ayodhya. He wanted to crown Rama as the next king. Kaikeyi and MantharaKaikeyi's personal maid, Manthara, was a very sharp and wicked lady. She went to the queen and told her that this decision was unjust and that Kaikeyi's son, Bharata, was more deserving and should crowned king instead. Kaikeyi said that she was happy because even Rama was like her own child and moreover, Bharata was very loyal to Rama. At this, Manthara retorted that Rama would become the king and they would all become paupers. She tried to poison Kaikeyi's mind against Rama. She reminded Kaikeyi of Dasaratha's promises and said this was the opportune time for her to reclaim those two wishes. Kaikeyi was influenced by Manthara's devious plan and under her evil advice, Kaikeyi reminded Dasaratha crown Bharata king and send Rama into exile for fourteen years. She went to King Dasaratha and reminded him of the two boonskaikayi reminding king Dasaratha to grant her two boon that he had once granted her for saving his lif. Dasaratha asked her what she wanted. She asked the king to grant her wishes that Bharata be crowned king of Ayodhya and that Rama be banished to the forest for fourteen years. The King was shocked when he heard this. He had not imagined that Kaikeyi who loved Rama so dearly, could be so cruel. A heart broken Dasaratha then pleaded with Kaikeyi and asked her to reduce the hardship of banishment. But Kaikeyi would not listen. 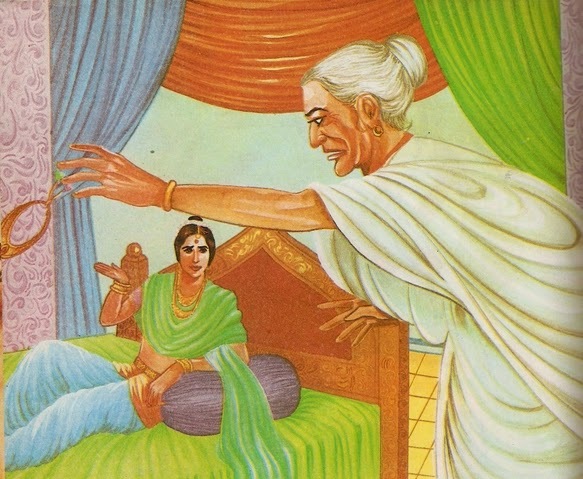 She reminded Dasaratha that it was wrong on a king's part to break his promises. Even today, we can see the place where Sumantra stopped the chariot near Kanaka Bhavan and from this place Raman thiruvaadi vaithu Raman, Seethai and Ilakuvan got into the chariot. First Ram helped Sita to get into the chariot, then Ram, then Ilakuvan got into the chariot. Everyone in that city, came to the Rajamargam and started to cry. Everyone including animals cried since Ram is on the way to the forest leaving ayodhya. Ram started on his journey and the first place he reached was Sringaverapura. We are going to see about Sringaverapuram - Guhan's place on the banks of river Ganga.